Estifnos Gezu is 10 years old. 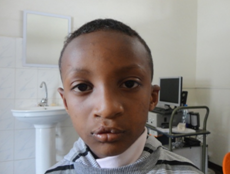 His lip revision was done at Yekatit 12, in Addis Ababa, Ethiopia, and he is attending speech therapy at the moment. Kalab Brhanu is doing speech therapy treatment. His palatoplasty was done Yekatit 12.